Preheat oven to 350. Line or grease and flour 12 wells in a cupcake pan. In a large bowl, cream the butter and sugar. Add the egg and vanilla, mix thoroughly. Meanwhile, mix together the cocoa powder, espresso powder and milk in a small bowl or measuring cup and set aside. Add flour, baking powder and salt to the butter mixture. Add the milk mixture to the rest of the batter and beat until well combined. Fill each well 1/3 of the way full. 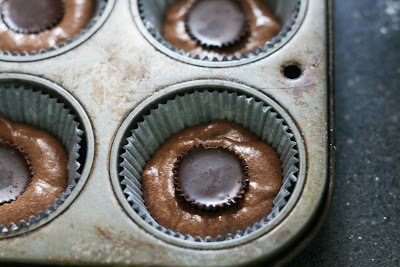 Place the peanut butter cup in the center and cover with batter. Bake 15 minutes or until a toothpick inserted the center of a cupcake comes out clean or with just one or two dry crumbs. Cool briefly in the pan, then remove cupcakes to wire racks to cool completely before icing. Beat all ingredients until fully incorporated. Spread on cooled cupcakes or cake. Top each with 1/2 of a miniature peanut butter cup. Years ago when Reese's first came out with limited edition dark chocolate peanut butter cup miniatures not being a fan of milk chocolate, I hoarded them. I am not much of a candy person (save our holiday boxes of Rheb's, the occasional candy bar or Haribo binge) but the miniatures were cheap, tasty and had a good chocolate to peanut butter ratio. I had hoped they would make them a permanent addition to their line up and it looks like they finally must have because I am seeing them everywhere, not just at Chocolate World or in limited edition bags. Anyway, my husband also loves the dark chocolate cups and may or may not have decimated nearly an entire bag all to himself. Luckily I was able to save a few and make these cupcakes. The recipe is easy, the trick to the chocolate-y taste in the cupcakes without having to melt chocolate is to rehydrate the cocoa powder in a bit of milk and add a bit of espresso powder to deepen the flavor. They also pack quite a peanuty punch. 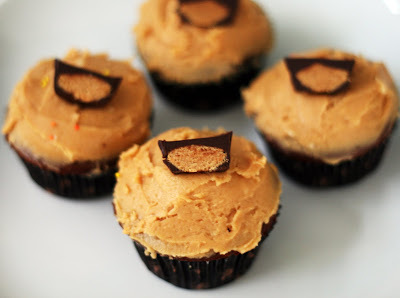 Perfect for any chocolate-peanut butter lover!